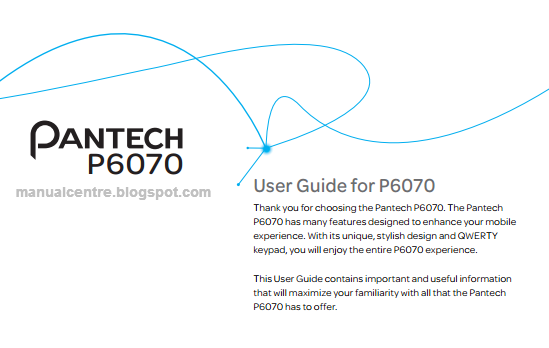 The Pantech Vybe manual or Pantech P6070 User Guide is available now. Many important information of this manual for example about Updating software, Troubleshooting checklist, Resetting the phone and tutorial how to Resetting the external memory card. The Pantech Vybe P6070 user manual available in english and spanish language. It consist of 178-pages (2.55 MB). This manual contains reference information such as Installing/Removing SIM card and battery, Inserting and removing a memory card, Screen lock/unlock, Using the Multitask menu on page 32, Using a memory card an dPC suite. Then about Using the address book, Using your headset, using camera, Message settings, using Bluetooth, Music Player Settings, Using the Mobile Web, phone settings guide, safety and more. 2. Enter password > OK > External Memory Reset. Solution: End the call and try again. Solution: Your phone may be set to MUTE. Disable the MUTE function. Make sure your hand is not covering the microphone. Solution: This may happen when you are in an area with low signal strength. Turn off your phone when it is not in use. Charge the battery when battery energy is exhausted. Solution: Make sure your battery is charged. Check to see if your phone works while recharging the battery. Solution: Either you are not registered to receive an SMS service, or you may be in an area where your network service provider cannot provide such a service , or your phone memory is full. Solution: Make sure to check the network service. Or check whether your phone is set to “Call forwarding”. If call forwarding is enabled, you must disable the “Call forwarding” function. This may be the result of one of the following cases. You may be attempting to use the phone in an overly hot/cold temperature. Try changing charging environment. Your battery may have not been connected to the charger properly. Check the connector. Solution: Your Address Book memory may be full. Try deleting some entries from your Address Book. Solution: You may not have subscribed to that function, or your network service provider may be in an area where such service cannot be provided. Contact your local service provider.